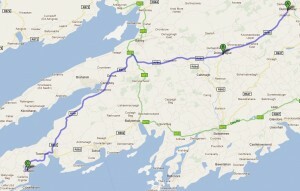 7th Route 2 Crook 5M Road Race, Sun 07-Aug-2011, 5pm — St. Finbarr's A.C. The 7th Route 2 Crook 5M Road Race takes place on Sunday afternoon August 7th at 5pm. The race starts in the picturesque village of Goleen and finishes on the Crookhaven peninsula serving up some spectacular scenery along the way. The event is organised by Mizen Rovers to raise funds for local underage hurling and football activities. A 2.5M race for the U-16s will start at 4.30pm, so the kids will be well on their way before the grownups start. The entry fee is €10 with entries between 2.30pm and 4.30pm in the Goleen Sports Centre, which is off up to the right just before you enter the village itself. 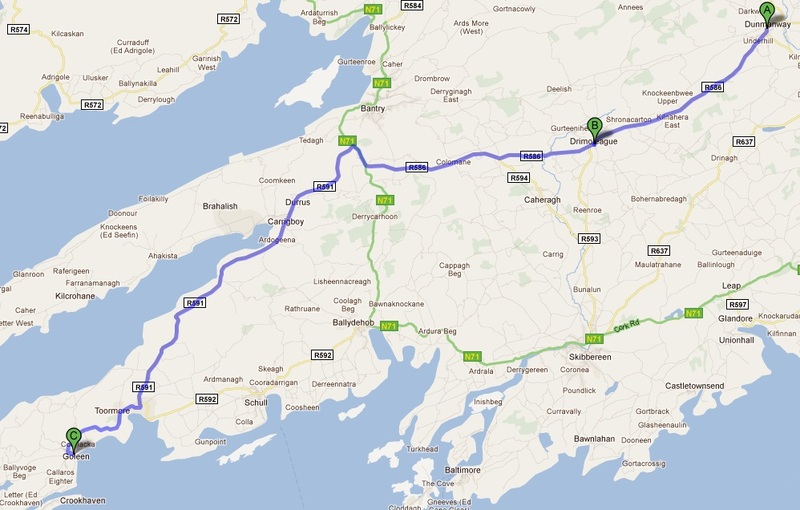 You can either leave the car in Goleen or drive out to Crookhaven. 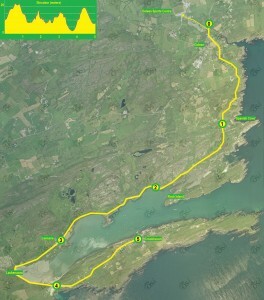 Either way, there’ll be a mini bus to bring people back to Goleen before and after the race. Just look for the guys in the yellow jackets. Pre race changing facilities are available in the Goleen Sports Centre, which is modern, spacious and clean. You can leave your gear bag here and have it trucked to Crookhaven for collection after the race. Post race changing facilities and refreshments are available in the Crookhaven Boat Club and the food’s always top notch. There’s a €150 cash prize and a trophy for the first man and lady plus prizes in all the usual categories. There’s also a €100 bonus prize for anyone who breaks the course record set by Alan O’Shea in 2006. After the prize-giving, you can enjoy live music and craic on the street in Crook. 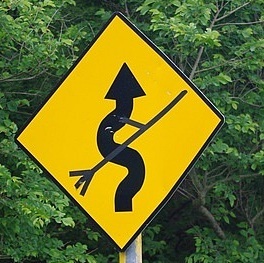 From Cork City, there are a number of ways of getting to Goleen. For the skilled navigator, head out west on the N22 past Ovens and turn off SW through Crookstown, Bealnablath, Coppeen and onwards through Dunmanway. If you’ve got the time, take the N71 scenic route onwards through Skibbereen turning off left onto the R592 for Ballydehob, Schull and Goleen. The wisest option is to take the N71 to Bandon. On entering the town, turn right onto the R586 passing through Dunmanway, Drimoleauge and Aghaville until you hit the N71 Bantry Road. Turn right for Bantry and about a kilometre up the N71 turn left onto the R591 for Durras and stay on this road all the way to Goleen. The course is up and down, but nothing arduous. There’s a long steady climb from just before the 4M mark with a fast downhill into Crookhaven for the last half mile. The most difficult part of this race is resisting the urge to clear the low wall and dive into Crookhaven Harbour at the 3.5M mark. If you’re thinking of throwing in the towel, this is a great spot to do it! If you persevere, the water is deeper in Crook. In any event, bring a towel! Throughout the summer, the local race calendar provides for the bread and butter needs of runners. Now and again however, it’s nice to indulge in a little cake. So, why not treat yourself to a large slice of West Cork. The annual Route 2 Crook is a pearl of a race and precious things as you know don’t come easy. Sure, it’s a long way to travel and you won’t want to abandon the wife and kids for a whole day. So, why not bring them with you! The summer festival will be in full swing with plenty distractions for the kids. You might even enter them in the U-16s race which goes off at 4.30pm. Irrespective of weather conditions, the Route 2 Crook is definitely a unique event and one that will linger in the memory long after others have faded. We hear it’s a Whiz of a Miz, if ever a Miz there was. We’re off to see the Mizen, the wonderful Mizen of Cork!